Multitudes of researchers have exercised their mental muscles trying to make man-made products mimic naturally-occurring structures. According to University of Michigan researchers, the cartilage in your knees might provide the inspiration for a “structural battery” prototype that would be durable and easy to shape. This blog has long promoted the idea of structural batteries, energy storage systems that could double as strengthening elements in the aircraft shell. Storing energy in car bumpers or airplane wings has some risk elements. What will happen to a battery cracked by collisions on the ground or excessive loads in the air, for instance. Nicking or puncturing existing batteries can cause flaming catastrophes. 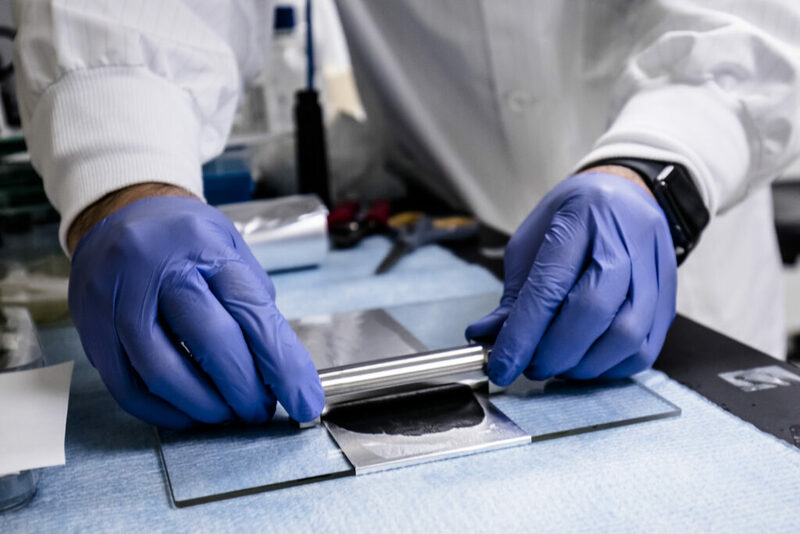 Ahmet Emrehan Emre, a biomedical engineering PhD candidate, casts a manganese oxide slurry onto a sheet of aluminum foil to serve as the cathode of a prototype structural battery in the University of Michigan North Campus Research Complex in Ann Arbor, MI on December 21, 2018. Researchers “sidestep” these problems by using zinc and branched nanofibers that resemble the collagen fibers of cartilage.” They form a membrane with the material that resists dendrite puncturing. The mechanical strength and durability of cartilage with the ability to let water, nutrients and other materials move through it are nearly identical to those of a good solid electrolyte, which has to resist damage from dendrites while also letting ions flow from one electrode to the other. Kotov’s team’s membranes shuttle zinc ions between the electrodes, and also stop zinc’s piercing dendrites. Like cartilage, the membranes are composed of ultrastrong nanofibers (taking the place of collagen) interwoven with a softer ion-friendly material (polyethylene oxide and zinc salt). To demonstrate their batteries are safe, the team deliberately cut and stabbed their cells. The batteries did not smoke or ignite and continued to produce their design voltage despite the damage. Because the zinc batteries are unable to charge and discharge as quickly as lithium cells, they are used as secondary or backup batteries. Kotov and his team research potentially better electrodes that are quicker charging and longer lasting. Researchers include Mingqiang Wang, Ahmet Emre, Siuon Tung, Alycia Gerber, Dandan Wang, Yudong Huang, Volkan Cecen, and Nicholas A. Kotov.